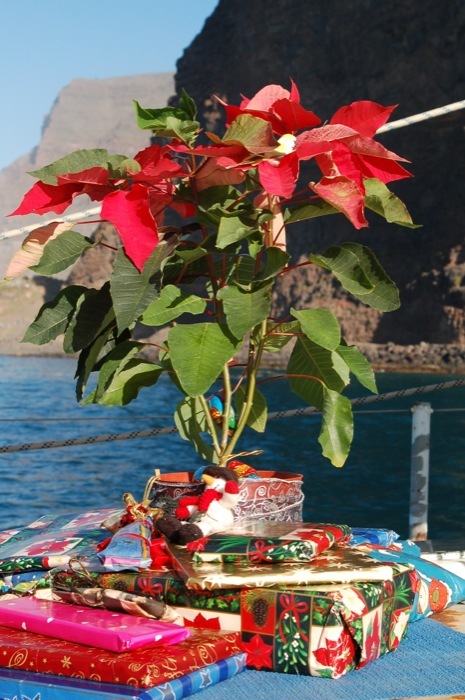 A window in the weather enabled the Mollymawks to pop across to La Gomera for Christmas, and here we met up with some other seafarers – or would-be seafarers – with a rather unusual vessel. The frail old man sitting on the quayside in La Gomera does not look like an adventurer. 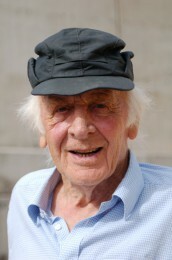 As we approach he waves a crutch in greeting, and I think to myself, “He looks just like any other aged old grand-pa. He might be on day release from a nursing home”. What do you think of An-Tiki? Decidedly, Anthony Smith is not your average OAP; but then he has never lived an average life. Born 84 years ago in southern England, he started out as an above-average scholar. After World War II (during which he served as a pilot in the RAF) he won a place at Balliol College, Oxford, where he studied zoology. After graduating he began work as a science correspondent for the Daily Telegraph newspaper, and from there he found his way into radio and television, writing several natural history programmes and presenting the BBC science programme Tomorrow’s World. He also found time to pen several books, including a widely acclaimed one called The Human Body. So far it has sold 800,000 copies. One might imagine that success as a writer combined with a high-flying career in television would be enough to keep anybody happy, but Anthony Smith was ambitious; he wanted to fly even higher. In fact, he wanted to go sky high. His work for the BBC had already led him to explore underground irrigation tunnels in Iran (then still known as Persia), and he had also ridden a motorbike the whole length of Africa. Bitten by the travel bug, he hit upon the idea of crossing East Africa again – but this time he would do it in a hydrogen balloon. Thereafter ballooning became Anthony’s principal fixation – and, as ever, he excelled in the art. In 1963 he became the first Briton to cross the Alps in a balloon, and when the British Ballooning Society was formed he became its president. The other silver-haired gent, as we later learnt, was Robin Batchelor, founder and owner of The Hot Air Balloon Company and co-star of a couple of television shows which involve ballooning across Africa and across Australia. If you’ve ever seen a film sequence or an advert which features a balloon then you’ve probably seen Robin Batchelor in action. Besides winning fame and fortune on the silver-screen he has also crossed the Channel by balloon four times, flown in 30 different countries, and crashed in half a hundred exciting different ways. He is also the chap who taught Richard Branson how to fly. Yet still Robin Batchelor pretty much goes down on his knees before Anthony Smith. 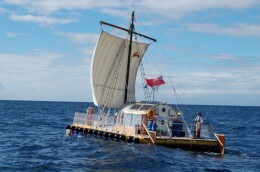 An-Tiki is quite a bit different from the vessel whose name it recalls. 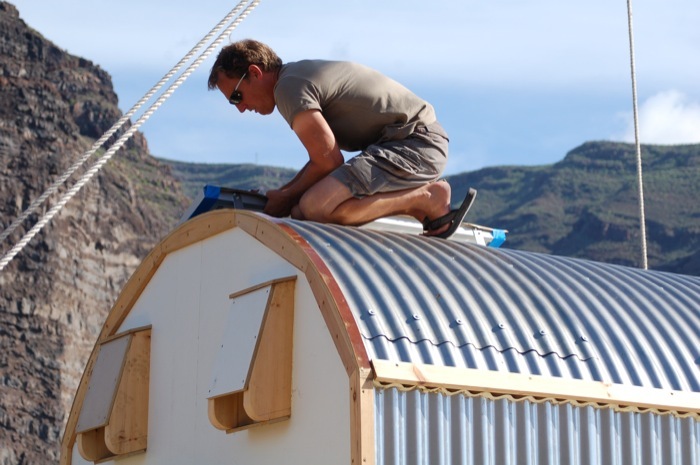 Whereas Thor Heyerdahl’s raft was built from balsa wood and was intended to resemble the kind of boat that might have been put together by ancient Amerindians, Anthony’s Tiki is made entirely of modern materials. The raft is made of massive water pipes with smaller pipes lashed atop them. Running athwartships atop the four buoyancy chambers are 14 smaller pipes. 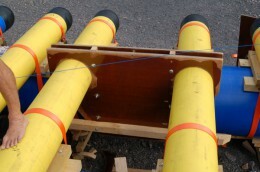 Those positioned at either end of the vessel are made from tough yellow plastic and were designed to carry gas. The ones in the middle are blue – like the floats – and they were intended, by their manufacturer, to carry water. 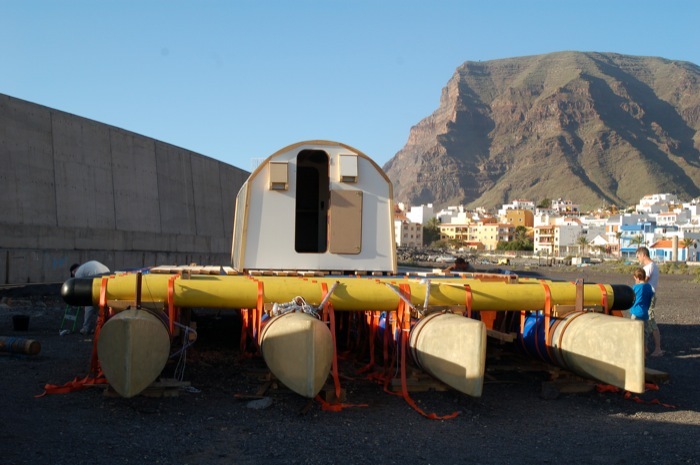 As it happens, this is still their purpose in their new life as part of the ocean-going raft: they will be used to carry the 2,000 litres of water which Anthony and his crew of three will require for the crossing. 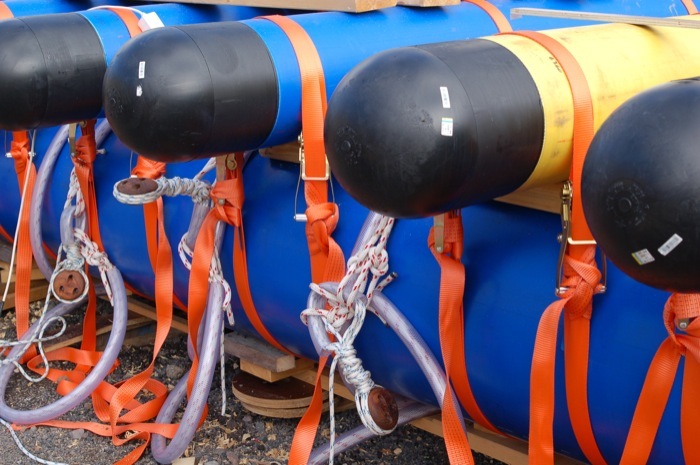 The pipes are fastened together by webbing cargo straps secured with ratchet tensioners - but the tensioners are made from mild steel. Will they rust before the raft arrives? 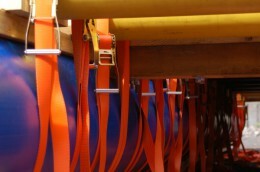 Short lengths of timber serve to locate the pipes at their proper angle, one to another, and they are lashed together using orange webbing cargo straps. Originally the team planned to use rope, but they felt that it would be easier to tighten the lashings using ratchet-tensioners (which are the device used by lorrymen to secure a load to their truck). “Won’t they rust?” we exclaimed in alarm, as we examined the construction. “The experts reckon they’ll be good for three months,” Robin replied. Slotted amongst the gas pipes, at each corner of the raft, are four rectangular shafts constructed from ¾” plywood. These are daggerboard boxes, and their purpose is to house four large plywood daggerboards – or “guaras”, as the crew call them. The boards are copied from ancient Peruvian rafts and they can be used to steer the boat. Depending on which ones are lowered, she will turn to port or starboard. That, at any rate, is the theory. Plastic pipes, widely spaced, don’t make a good deck – particularly not for a man who walks with the aid of crutches – and so they are to be overlaid with stout wooden planks. There are some who feel that shutterboard would have done the job as well, and even as we watched and listened the crew were still discussing this part of the design. One of the greatest fears for a rafter is of his lashings falling slack and the timbers (or pipes) becoming skewed from their neat perpendicular intersections, until they meet diagonally – like the slats on a folding fire-guard. Which type of decking would be most efficient in preventing this sort of catastrophe, the Captain wondered? 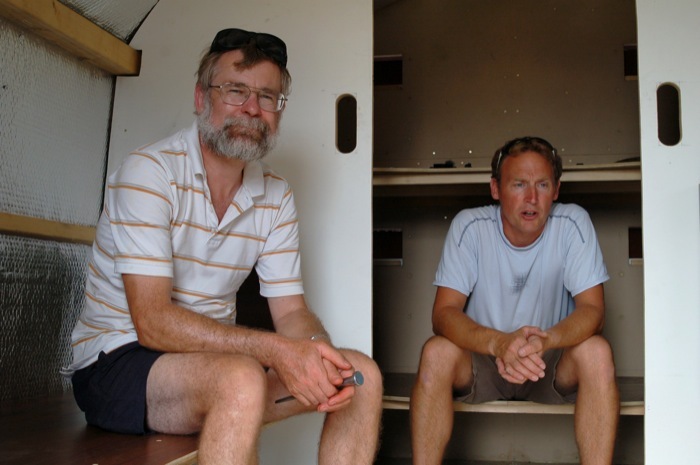 Accommodation for the voyagers consists of a single deckhouse – or “pod”, as Anthony and Robin call it. (Perhaps it’s a ballooning term?) When he first began to make plans for this little expedition Anthony spoke of using “a converted pigsty” – one of those corrugated iron affairs, we assume – and viewed from afar the cabin looks like a road-mender’s hut – which is a corrugated aluminium affair. However, in reality the “pod” is actually a bit of a des res, being a tall structure crafted from corrugated stainless steel and lined with heat-deflecting foil. Two well-constructed bunks on either side of the cabin serve as locker-seats and also as beds, in the conventional manner. Two more bunks occupy the after wall, one above the other. The galley and the chart table (with satellite navigation and communication systems) are set at the for’ard end of the cabin on either side of the door. Yes, the door faces for’ard, because this vessel is only ever going to go downwind. Lacking a keel, and lacking an efficient set of sails, that’s the only way she can go. 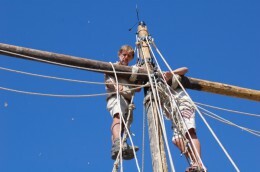 Directly for’ard of the deckhouse (pod, pigsty, road-mender’s hut) stands the single mast – a stout timber bearing an uncanny resemblance to a telegraph pole. Dressed by a rigger who was evidently accustomed to working on old gaffers and the like, it looks somewhat out of place: the only truly maritime thing aboard this bundle of plastic pipes and other industrial hardware. Mock-hempen ropes, beautifully spliced, and seized with tarred twine, lead down to pass around hand-crafted dead-eyes. But there the boaty business ends abruptly. The dead-eyes are rove with braided polyester which passes around the water-pipes in PVC tubing. The purpose of a mast is to carry a sail. Of course. An-Tiki’s sail is a square one, especially made for the vessel by a sailmaker in Devon. With it she will go pretty-much directly downwind, regardless of which of the four “guaras” is in the water – or so we Mollymawks believe. Having recently watched a square-sailed Phoenician ship fail to sail a beam reach we find it difficult to believe that this raft will do better. If her crew can get their craft to sail 30 degrees either side of directly downwind they will be doing as well as could possibly be expected. That, in any event, is our ever-so outspoken opinion. And that brings us to the question of destination. Whither is this quirky craft bound? “Eleuthera,” says her captain confidently. 70-odd years ago, when Anthony Smith was a lad, he read a newspaper report concerning a ship which was sunk by a German raider (a merchant vessel fitted with guns and equipped with surveillance aircraft). The sunken ship was a British merchant vessel called Anglo-Saxon, and it was minding its own business – pootling south towards Buenos Aires with a cargo of coal – when it was torpedoed. Not content with sinking the ship the enemy then proceeded to destroy the lifeboats, one after another. By the time they had finished their business only one small jolly-boat remained, hidden in the darkness of the night, and into it climbed seven survivors. 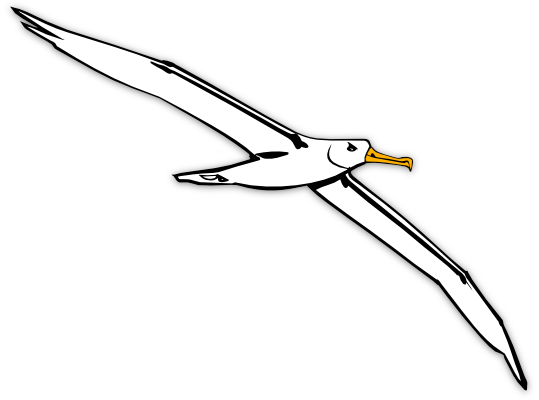 Anglo-Saxon was 800 miles west of the Canaries when she was sunk, and the jolly-boat – although equipped with a lugsail – made slow progress from this position. By the time she reached the far side of the pond, 70 days later, only two men remained alive; and those two awoke one morning to find themselves washing ashore on a sandy isle – the island of Eleuthera, in the Bahamas. Thus, Anthony Smith believes that any vessel drifting on the current will wash up in Eleuthera… Or does he? “And I’m sure I’d be very happy,” he says with a smile. Eleuthera is the target destination, then; but the real purpose of the expedition is simply to go, and to do, and to be; to travel, and to find out. To live. Now Anthony has the money, but he also has metal pins in his legs. They were got, not as a by-product of old age nor even through a ballooning accident, but as a result of being run down by a motor car whilst he was walking – on the pavement, mark you! – only a few yards from his house. Perhaps Anthony has another message to pass on, besides the one about getting out of your bath-chair: people have told him that he is too old to be larking around on the ocean on a raft, but could the forthcoming adventure really be any more dangerous than that gentle stroll along a suburban English street? As an added bonus, he is using the project to raise money for Water-Aid, a charity which seeks to provide safe drinking water to people in Third World countries. One’s immediate first impression, on visiting the raft, is of a bunch of happy and very likeable people who are working together in concert, most efficiently and effectively, but who don’t really know what they are about. Rather like a group of musicians mending a car. Or a group of yotties building a balloon… You can imagine how that would go; and you can imagine how you would feel, watching them. Possibly the most startling thing about An-Tiki is the design; or rather, the lack of it. Like the ostrich, she seems to have been assembled by a committee. Nevertheless, like that wonderful creature she seems to be turning out rather well in most respects. We are also somewhat concerned about the raft’s ultimate stability. Her weight is such that, according to your calculations, she needs the buoyancy of at least two of the big water-pipes to keep her afloat. If ever the rolling swells pick up the stern and send the raft nose first into the wave ahead then she will broach – she will be forced to round up, so that she is sideways onto the wind and sea. The windage of the deck-house will not help at all when the crew try to get the raft heading downwind again, and if the following waves shunt her along sideways then the leeward pipes might be submerged, seriously jeopardising stability. A worst case scenario, of course… and hopefully the raft’s stout wooden deck and the gas pipes would provide sufficient buoyancy to prevent disaster. Other niggles include the cargo straps and their tinny tensioners. If the raft begins to twist – as she is quite likely to do in three metre swells – then you will need to be able to tighten the lashings. So do grease those gadgets well, won’t you? And do make sure that the crew can still get at them when the vessel is bobbing about on the briney. It will be interesting to see how the rig gets on as the pipes move in relation to one another. One camp holds that the stays should be able to stretch, in order to allow for this flexing. The other wants bar taut rigging which, it is felt, will help to keep the raft rigid. We’re not sure which theory we favour… but we reckon that you should certainly carry plenty of spare rope, in order to be able to cope with breakages. And how about sealing the edges of the plywood daggerboards and the daggerboard cases? Even marine grade plywood will delaminate if you leave it to soak in saltwater for three months. The deckhouse gets our approval, although it is rather tall, but the fact that it isn’t an integral part of the structure causes us some concern. 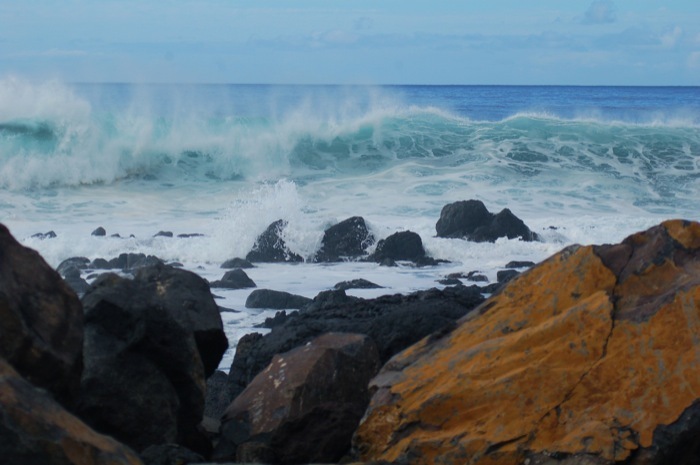 Hopefully, you won’t meet any bad weather or big swells. At this time of year, provided you manage to head south from the Canaries, you shouldn’t get anything stronger than a force five or six. Still, it’s best to be on the safe side: that hut, which will contain all of your provisions, must be fastened to raft in the most secure manner imaginable. And even then, we would like to see some of the vitals and some of the fishing gear kept on deck, in another very securely lashed canister. One of the most impressive things about the An-Tiki project is the way that Anthony’s friends have rallied round to help him. Anthony has also managed to rope in his elderly Israeli cousin, Margaret, and his cousin’s grandson, and one of the grandson’s friends – all of whom flew to the Canaries especially to lend a hand, and none of whom is skiving. The two teenage boys spend all day cutting and fitting pieces of wood to the raft, according to Tony’s instructions. Beryl Bainbridge at work on An-Tiki's bow. She would love to be making the crossing aboard the raft. 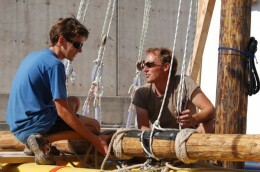 Meanwhile, the other members of the crew are also involved in the construction of the raft. Anthony originally intended that the voyage should be undertaken by a team of four pensioners, but when no other old crocks responded to his ad he enlisted three youngsters who are in their fifties. Working hard alongside Tony we found Andy Bainbridge, a Canadian citizen and a doctor of medicine, who used to keep a yacht in the States and sail her to and from the Caribbean. Dr Bainbridge has brought along a whole sackful of medical supplies, ranging from anaesthetics and sutures to neck splints and a resuscitation pump; so from this point of view, at least, the rafters are better equipped by far than most of their fellow seafarers. 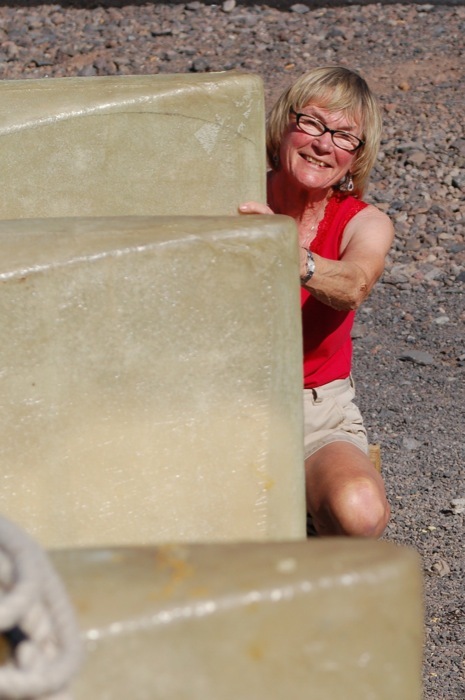 At 73 years of age, Andy’s wife, Beryl, meets one of the skipper’s original criteria – and she says that she would love to go rafting across the ocean – but alas the second criteria is that the applicant be male. The other members of An-Tiki’s crew are John Russell, whose sailing experience has all been in Wayfarers, and Dave Hildred, who is the only one of the team ever to have sailed across the Atlantic before. Dave now lives in the Virgin Islands, in the Caribbean, but by virtue of his prior experience of the ocean he has been appointed Sailing Master. He it was who enlisted John and Andy, for the trio are actually school friends! Knowing each other of old they work well together as – in compliance with Tony’s instructions – they assemble the raft. Funnily enough the only member of the crew who doesn’t appear to be pulling his weight is the captain. Anthony sits on the sidelines and watches his team at work. Perhaps the effort of pushing a saw would be too much for the octogenarian, but still one is surprised to see what little interest he seems to have in maintaining control of his project. Perhaps there is something else going on here: Anthony provided the inspiration, and the others are now finding their way around the problems, learning as they go. He seems to take as much pleasure from observing their behaviour as a naturalist studying the antics and interactions of a tribe of chimpanzees. Of course, one never does know how long an ocean crossing will take – it all depends on the wind – but in this case there is absolutely no basis for any speculation, because nobody has any idea how fast a pile of plastic pipes can be driven by one smallish square of cloth. One of the less experienced members of the crew suggested to us that the raft would probably average four or five knots… This is about what we would expect Mollymawk to average on this particular passage. Indeed, it’s considerably better than we managed last year when the winds were lighter than usual. 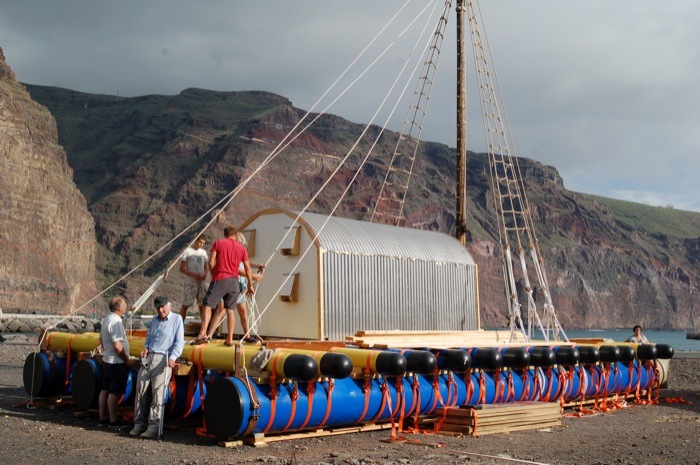 For what it is worth, the celebrated junk-built raft which crossed from California to Hawaii in 2008 travelled at only half a knot. And, being made entirely of plastic bottles encased in old fishing net, she was very much lighter than An-Tiki. If the mariners set sail at the wrong time An-Tiki could end up back on the beach in La Gomera. The speed of the vessel – and its landfall too, perhaps – will be dictated by the winds, and these will depend upon which route the voyagers follow. If the raft heads directly westward, at the latitude of the Canaries (as the old jolly boat is thought to have done), then it certainly could run into some nasty weather. And this weather is likely to take the form of strong headwinds which would ferry the vessel directly back to the shore it lately left. Then again, if the rafters head south in search of the tradewinds they might find themselves unable to make the necessary northing on the far side of the pond. Perhaps they will wash over to Brazil, drift north on the strong coastal current there, and be carried into the Amazon… Or into the Dragon’s Mouth, between Trinidad and Venezuela… Or perhaps, like the yacht which was abandoned during the 2009 ARC race, they will wash up in Antigua. 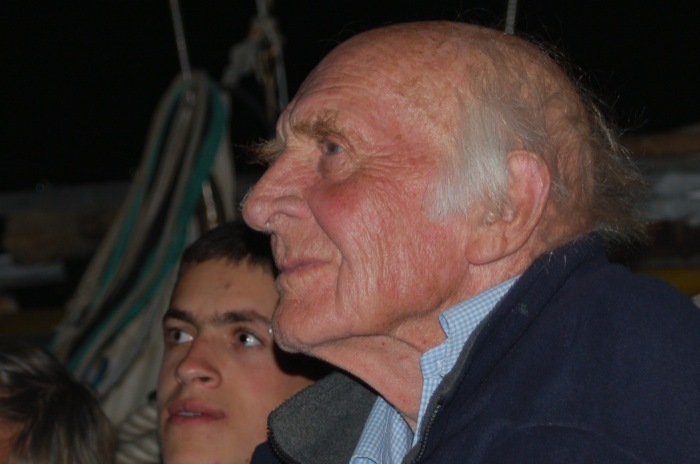 I’ve an idea that ocean sailing – and ocean drifting – will suit Anthony Smith very well, and that he will wish he had come to it many years ago, in his youth. He won’t mind if the passage takes the full 70 days that those torpedoed sailors took. 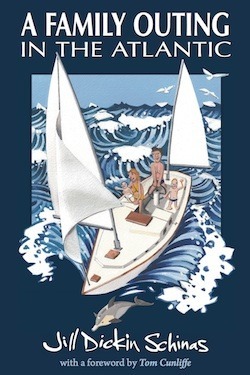 He’ll watch his crew play with the sail, urgently seeking to drive the raft half-a-knot faster, and he’ll smile. He’ll be pleased when they find out how to catch fish, but he’ll not worry unduly if they don’t. I doubt if he’ll ever give a single order or even make a decision. And whether they complete their passage plan or not he will be satisfied with the fact that he is making what he likes to call an Elderly Crossing. That, I suspect, will be the name of the inevitable book which will follow; and the cover will feature a revamped version of the familiar road sign, with the two stooped figures at the centre of the red triangle throwing their walking sticks in the air and jumping for joy. That, after all, is what Anthony is doing – symbolically if not quite in reality. The raft is equipped with a tracker and so you can follow their progress. On January 30th the wind was fair and An-Tiki was finally ready to set sail; and so, without further ado – and without any form of sea-trials – that is what she did. Dave, Andy and John had just spent their first night aboard; Captain Smith joined them early in the morning, and by the time the Mollymawks had finished their breakfast the raft was being towed out to sea. That was now eight weeks ago – and yet the raft is still little more than half way towards her destination in the Bahamas; so what has gone wrong? A yacht setting out from the Canary Islands might expect to be arriving in the Caribbean after little more than three weeks – but An-Tiki is not a yacht. Her hull is streamlined but it is not hydro-dynamically shaped, and her one small square sail can only pull her downwind. Thus, when they meet contrary winds the rafters can only drop the sail, toss out a small storm anchor, and pace the deck in frustration. Yachtsmen heading for the Caribbean don’t generally head west straight away; and nor did An-Tiki. However, she did turn right rather sooner than we personally would have recommended. As a result she has met with a series of lows. Fortunately they have all been small, but they have still sent the raft drifting back the way she came. Had the skipper continued south to 18 degrees or less then the raft would have found the Trades, which are the more reliable, stronger winds circling the ocean. These winds would have carried the vessel onward at greater speed. Dave’s reason for not wanting to come this far south is, however, perfectly sound: if they head south then eventually, having crossed the pond, the rafters will have to head north again to the latitude of the Bahamas; and no one knows whether their vessel is capable of doing this. No one knows whether she can reach (with the wind on her beam) in a force five. It should also be noted that the Bahamas are a good deal further from the Canaries than Barbados or Antigua, so that even a well-designed yacht would take a week longer to reach this destination. Thus, the proper answer to the question is that nothing has gone wrong. Rafting just takes a bit more time and patience than yotting. Despite fears about her construction the raft seems to be holding together well. 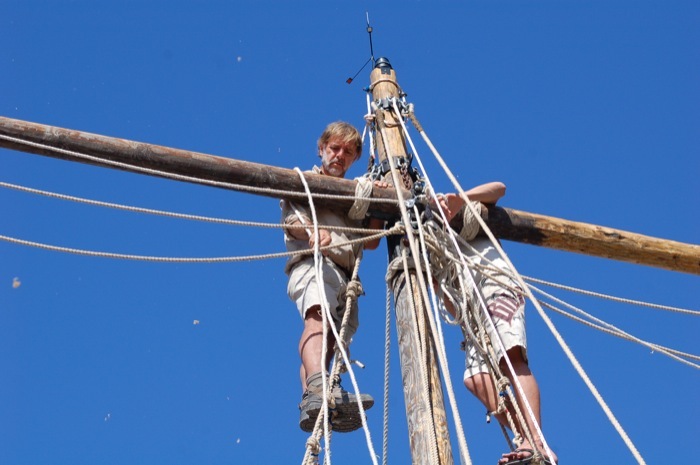 The webbing straps which fasten the water-pipes have not slipped; the pipes have not moved about in relation to one another, as the Kon-Tiki’s balsa logs did throughout that voyage; and the tensioners have evidently not rusted away. 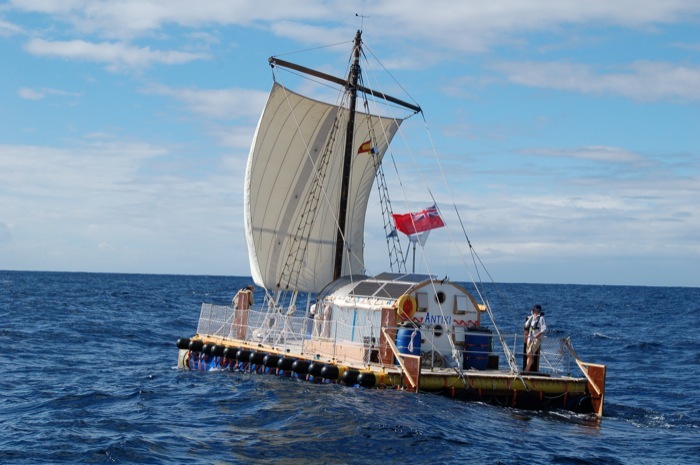 The raft is apparently quite stable – although it has to be said that she does not appear to have met with any particularly testing seas. Hopefully she never will! One of the few things to have given the rafters any trouble was the rudders which, acting on the advice of various well-wishers, they finally elected to fit. On the second day out these both snapped in half! The chosen design was for spade rudders and, unfortunately, no stops were fitted; so the balanced blades were able to turn sideways on to the direction of travel. Despite being massively constructed the rudders were not able to cope with this kind of force. They broke at the point where the pintles were fastened. Many seafarers would have given up when faced with this sort of crisis – indeed, many seafarers HAVE given up, and called for help, when their rudders broke – but despite the fact that they were still almost within sight of the Canaries the crew of An-Tiki decided to press on. For this they are to be congratulated. Since the boards are very heavy they do not like to have to move them too often. 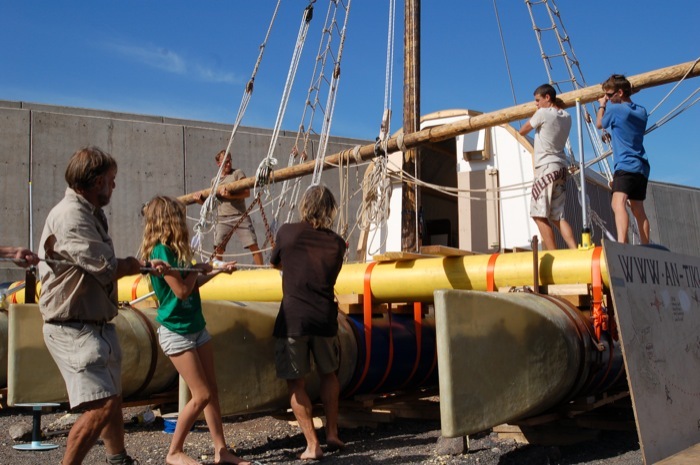 As An-Tiki gets closer to the Caribbean she will meet stronger winds, and so she ought probably to be able to reach the Bahamas before the end of April; but will the crew be willing to press on and achieve what they set out to do? The nearest piece of land for them at the moment is Antigua. In order to find the Bahamas they will have to sail close past St Maartens, past Anguilla… and past the Virgin Islands. Will Dave really have the strength to turn aside from the island where he has made his home and to keep right on – past Puerto Rico; past Hispaniola; past the Turks and Caicos? Today (28th March) the captain of An-Tiki announced that a destination had been chosen… which seems an odd turn of phrase given that the rafters’ avowed destination has always been the island of Eleuthera, in the Bahamas. As of today, however, the plan is to head for the Caribbean island of St Maarten, which just happens to be the nearest piece of land, lying roughly 500 miles downwind of the vessel’s current position. In making his announcement Anthony explains that the voyagers wanted to show that a raft is “navigable”, but in reality stopping the journey at the most convenient place will do exactly the opposite; it will tend to suggest that the rafters fear that An-Tiki will be unable to make enough northing to clear the Windward Islands and reach the latitude of the Bahamas. If the raft cannot make up then, certainly, choosing the most accessible piece of land was the only sensible course of action. The northern coasts of Puerto Rico and Hispaniola are wind-swept and wave-swept, and we certainly don’t wish to hear that An-Tiki has made her return to terra-firma in the same way that Kon-Tiki did: by failing to weather one of the Tuamotos and crashing onto an off-lying reef. We wish Anthony and his crew an easy landfall – in the broad light of day – and a safe and uneventful arrival. 65 days after setting out for Eleuthera, in the Bahamas, An-Tiki made landfall on the island of St Barths and a few hours later she arrived at a pre-arranged rendezvous position two miles off St Maarten. From here the vessel was towed into the Lagoon, and she is now safely berthed. One might imagine that Anthony would now be happy to lie back and bask in the glorious praise heaped down upon him from all quarters – after all; there are not so many disabled folks who can claim to have spent their 85th birthday on a raft in mid-Atlantic – but in fact the ancient mariner appears to have mixed feelings about his achievement. So far as he is concerned, An-Tiki was perfectly capable of pushing on to her original destination: the one chosen by him many, many years ago, and the one for which the crew signed-on. It is a pity that after having invested all of his savings – to the tune of £60,000, we hear – the captain should be cheated of his dream. However, knowing Anthony we feel certain that he will take this disappointment in his stride and will do the thing that he set out to do. Yes, we fully expect that he will embark again, this winter, and that the “bundle of plastic water-pipes” will complete the journey for which she was built. The raft appears to have survived the expedition without suffering any major structural failures. As we understand it, she showed no tendency whatsoever to flex, and so the webbing straps did not need adjustment. The ratchet tensioners have not seized up – yet… (We hope that somebody has been detailed to grease them over the coming months.) The daggerboards have not delaminated (yet…) and they are said to have worked reasonably well. The raft did not meet with any bad weather and so her stability was not tested. 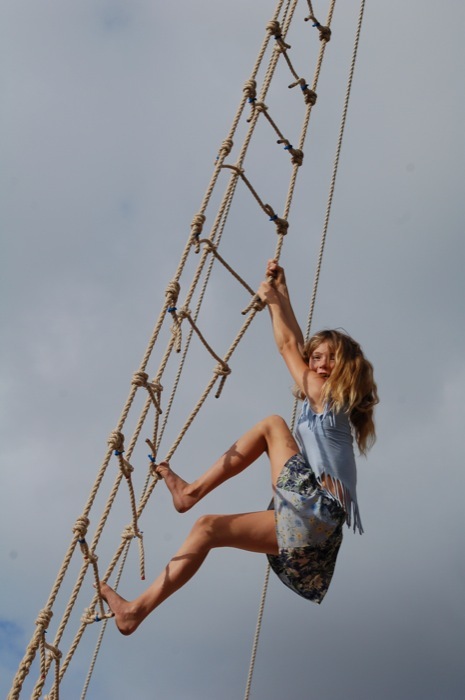 So, if you fit the bill – if you are female, fit enough to climb the mast, and competent to sail and navigate – and if you would like to sail An-Tiki from St Maarten to the Bahamas, feel free to drop us a line and we will put you in touch. Thank-you to everybody for your comments on this article. Brilliant, brilliant, brilliant. We would expect nothing less from the remarkable Mr Smith. This is a wonderful article, full of interesting facts yet containing a very lighthearted view. We wish Anthony and his crew all the luck in the world with their voyage. We shall follow them online. Our love and good wishes to Anthony, Robin and all. PS. Can’t wait for the book to come out. You go Ants!!! I still remember playing house in your balloon basket which you kept in our garden shed at Hop Garden Cottage. Hope you have a great voyage. xxxxxxx Dog-D.
Great article,loved it and I will follow them online for sure!Best wishes to Anthony and his crew on this voyage.Great Adventure,looking forward to the book! REALLY Great Feature Jill ! You should send it to the Telegraph & other Broadsheets, as its SO well written. I could give you a few contacts if you like – email me. Tony is a star, & an all round top guy in everything he does. As well as being Opps Manager at Challenge he organised the fun things too, like the which bar to meet on a friday night after work……. Glad you have met him, he will be a friend forever & I have lots of respect for him. I wish I could have helped, but I was seeing Dr,s back in Blighty. (long story for later) Now I am back in Rainy Cusco (summer here is Rainy Season), but its mostly at night, so pretty considerate rain. Loving being back in Peru, its a great part of the world, and central for so much, Glaciers up on the Andes, the words highest sand dune, the Amazon & the Pacific coast too. Thats why the Inkas called the the “Navel” not so glam, but quite right. I have had a few computer probs, but am getting back online now, so we MUST have a chat soon. I am on Skype, & I will have a look to see if you are too. That would be great as its an awfully long long time ago that we all met up for our Atlantic jolly. Fair play to everyone involved and good luck for the trip. We were at the launch until the bottle broke; spoke to John Russell on the Quay; met you in Habibee on Burn’s Night 25th January; sang ‘whatever will be will be’ to you. We are tracking your progress on the Yellow Road. May the currents be with from Canary to North Equatorial. We are following your progress and a number of our friends are watching your journey. Your articles about Antiki are so full of misinformation – Failure?? in arriving in th Leewards – it was made very clear to the crew that if the raft left late from Gomera – (as it did due to poor Project management!!! – by your so called PM) and then weather and if the trip was slow ( as it was because Anthony dictated that they stay north) – then it was understood that the trip would end in the leeward or Windward islands. John was NOT a school friend of David and Andys and he was NOT chosen by David Hildred. Anthony Smith accepted John on the raft. 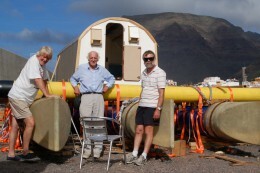 Tony Humphries was NOT the project manager – there was NO project manager but I would like to point out that David Hildred was working on aspects of the raft from easter 2010 and was responsible for having his friend Alan Patrick design the rig and Alans friends Rick and Tess went to Gomera to put the rig in place. the raft was never meant to have a rudder – there was a sweep to use in case it was required but the guaras were meant to do the work. Unfortunately only one accommodation pod was put on the raft instead of the two – I believe after the rig was shortened – and hence the center line Guaras we not added. 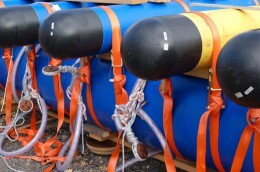 And the flotation aspects – the pipes have positive buoyancy. Also the raft is basically a 1:2 ratio in the dimensions that has ben sugested is a very stable ratio for such a craft. I don’t think that the word failure is mentioned anywhere in this article. However, it is true that by changing their destination, at this late stage, to St Maarten the rafters will obviously have failed to achieve their original, much more ambitious objective. The popular saying is that one can cross the Atlantic at this latitude in a sieve, it is so easy; whereas getting the raft – with its one square sail and it’s lack of keel – to travel along the Windward chain would have been quite an achievement. 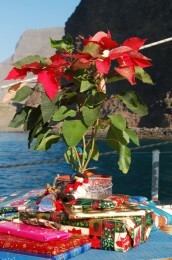 The raft left from La Gomera on January 30th, a date which is generally considered to be absolutely perfect for a crossing. Anthony made it very clear to the crew that he wanted to go to Eleuthera – not to the leewards or to the Virgins, or where-have-you – and the crew agreed that they would try to get there. This avowal was made within my hearing. Seemingly the crew did not believe it when we suggested that the crossing might take three months. They have jobs to go to, I suppose, and thus they want to end the trip prematurely. That’s fair enough – although Anthony probably doesn’t see it that way – but it ought to be understood that there is absolutely no other reason why the raft should not press on to Eleuthera. As I’m sure you know, being a resident of the Virgin Islands, the hurricane season does not begin until the start of June, so it is not an issue. I find it very hard to believe that Anthony “dictated that they stay north”. After all, Anthony has always made it clear that he has no knowledge of navigation or of sailing. That is why he appointed your husband as Sailing Master! 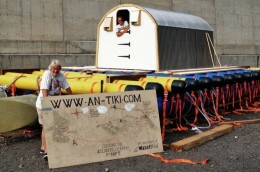 The An-Tiki blog makes it clear that decisions regarding the course which the raft steered were left to Dave. As I have pointed out, the decision to cross at a relatively high latitude was not necessarily a bad one. It resulted – inevitably – in a long, slow crossing with headwinds but, as I have said, there is considerable doubt as to whether the raft would have been able to climb back up from 16 degrees to 25. The “so-called project manager” as you label him was actually introduced to me as the project manager! 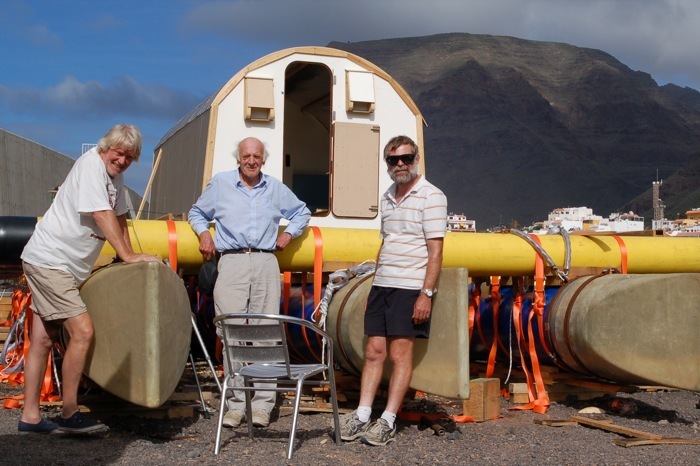 More importantly, he – Tony Humphreys – was, indeed, managing the project: he was organising the construction of the raft, and without him the raft would not have been built so quickly or so well. He is an amazing guy! Naturally, other people played their part in the project, but when writing about an event of this kind one does not normally list the rigger, the chap who provided the communication system, the woman who wrote out the shopping list, Uncle Tom Cobbley and all. These people receive credit on the An-Tiki website, as is proper, and no doubt Anthony will list them in his book. One might also point out that most of the people who contributed to the project but who did not go to sea were well paid for their efforts; including your husband’s friend, the rigger. I should perhaps have mentioned the designer – but then, as I have said, the raft seems to have been designed by a committee. 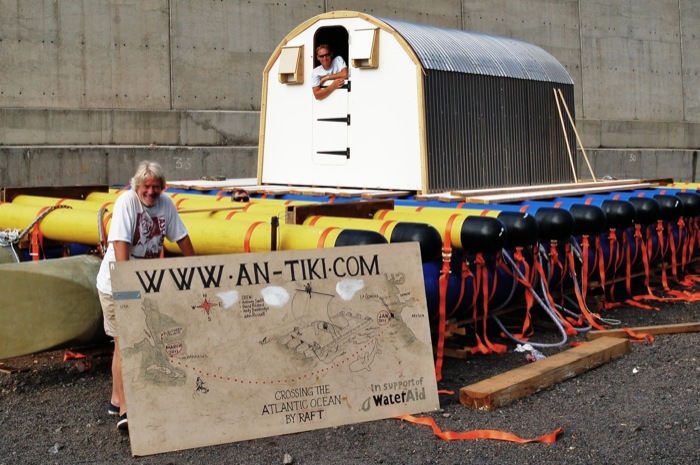 I have corresponded with the person who inspired the project – the one who designed, and built the first water-pipe raft after Anthony approached him – but this gentleman seems to have no wish to have his name attached to the An-Tiki; so I will refer to him simply as B. B evidently feels that the end-product has wandered too far from his specifications. He it was who researched the use of daggerboards/guaras and he used them, with great success, on his prototype raft; but the guaras fitted aboard An-Tiki are very different. I believe that B also advised that the raft be fitted with a junk sail instead of a square-sail. The prototype raft, which boasted a junk sail and numerous well-positioned guaras was – I am told – perfectly capable of going to windward. It seems pointless to list the people who have made changes to the original design when these changes appear to have led to the construction of a less efficient, less manageable vessel. If I have misunderstood Andy and John’s comments regarding their school days and the manner in which they came to meet Anthony then I apologise; but neither has bothered to correct me, so it would seem that they are not really too upset about this apparent faux pas. Your comments regarding the stability of the vessel reveal a lack of understanding of this matter. Naturally the pipes have “positive buoyancy”; otherwise they would sink! Nor is the ratio of the length-to-beam especially relevant. What counts, in heavy weather, is the Angle of Vanishing Stability. Basically what this means is that if a vessel is thrown onto its beam (or to a step angle of heel) by a big wave then there must be something – some balance weight – which will bring her back up again. If there is no counterweight then the boat falls over. If a catamaran is thrown onto its beam-ends there is sufficient buoyancy in the lower hull to take the weight of the whole boat. In the case of the raft the buoyancy is a lot less, and so a large amount of the vessel would be under the water. So – at the end of the day it seems that there is only one piece of “misinformation” (regarding John’s schooling). Not too bad considering that, according to Andy, there were no fewer than 16 errors in the Sunday Telegraph’s piece – and some of them were real howlers! I’m not sure who it is that I am suppose to have insulted… Perhaps you would like to be more specific, as I don’t like to feel that I have caused offence anywhere. We climbed the mast. Well, three of us did, and I didn’t…. We examined the construction in minute detail; we helped to raise the yard; we sat in the cabin; we gave advice when we were asked to, by Anthony, Robin, and Tony… And we are still in touch with them now. 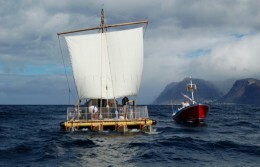 We also accompanied the raft as she left La Gomera and we saw how she behaved in a very small sea. I hope this detailed response has put your mind at rest, Trish. When An-Tiki arrives in the Caribbean you will be able to see the raft for yourself, and perhaps you will even have the opportunity of sailing aboard her. This aspect (of the raft’s handling and manoeuvrability) is, I think, the only one which I was unable to research. It seems a long time ago since we met you on ‘Our Monarch’s hinmost year but ane, Was five and twenty days begun.’ Hope you enjoyed some haggis on the way! EWe tracked your journey. Well done. ‘Whatever will be will be’. James & Heather, Edinburgh.